Houston Baptist University welcomes Scott Cairns, Jason Harrod, Doug TenNapel, and me! 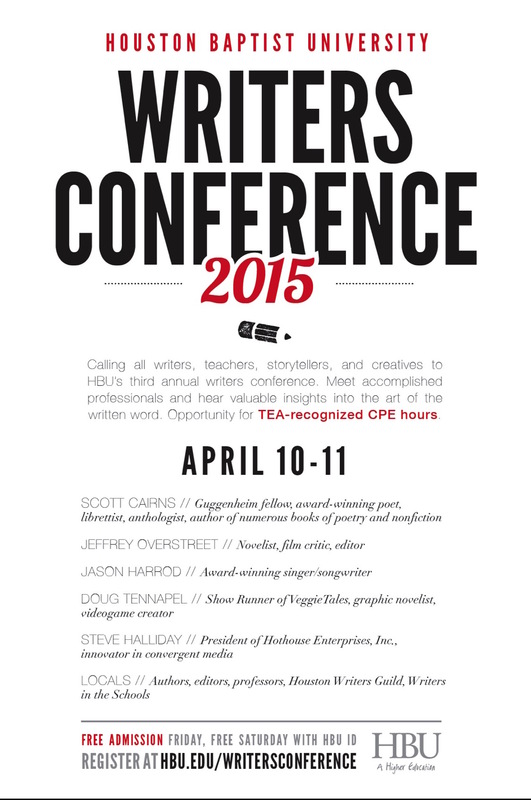 HBU’s annual Writers Conference takes place this year on Friday, April 10 and Saturday, April 11. We have some amazing speakers again, headlined by award-winning poet Scott Cairns. In addition to Mr. Cairns, we’re featuring a number of other high-profile speakers, including current Emmy Award nominee Doug TenNapel (see attached flyer for more). To register, and to view our schedule and list of speakers, visit the site: hbu.edu/WritersConference. A new feature this year is the opportunity for educators to receive TEA-recognized Continuing Professional Education (CPE) hours. But all are welcome; our schedule covers a huge range of topics, and writers, teachers, and artists—of all stages—will find something to benefit them. Family rates are also available! Email gjohnson@hbu.edu for details. And help us spread the word! Send the attached flyer to colleagues, students, friends, or anyone you think might be interested. Feel free also to simply forward this email. We’re really excited about this conference and hope to see people from all over Houston, and even Texas, again this year. Sounds like fun; say hi to Jason for me. Harrison Ford is back in character!